I'm linking up with Kacey at Doodle Bugs Teaching to share 5 random things from this week! My kids are still loving these water colour observational drawings/paintings. 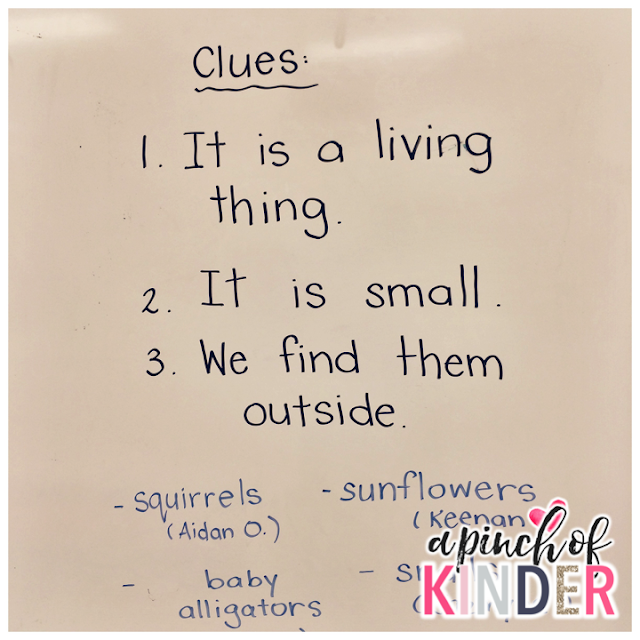 Some of the items we have been looking closely at and painting include pinecones (pictured above) and caterpillars. 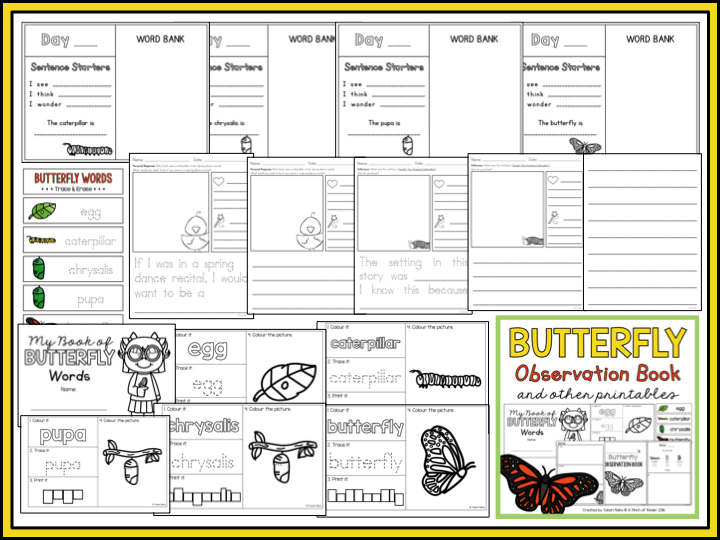 We often put magnifying glasses out as well to encourage the kids to look carefully and draw with detail. We have such good writers this year and so many kids are ready to move past one sentence. 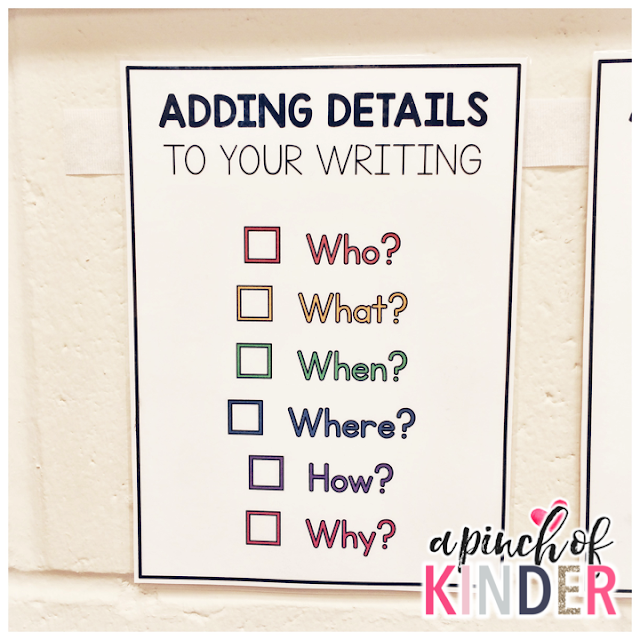 Adding detail was a next step for so many of our kids after our monthly guided writing piece last month so we did this mini lesson and will continue to practice this once a week until the end of the year. During our writing mini lesson I told them that I want to know more about their writing and taught them to ask themselves if they have answered most of the questions below. Who did it? What did they do? When did it happen? etc. 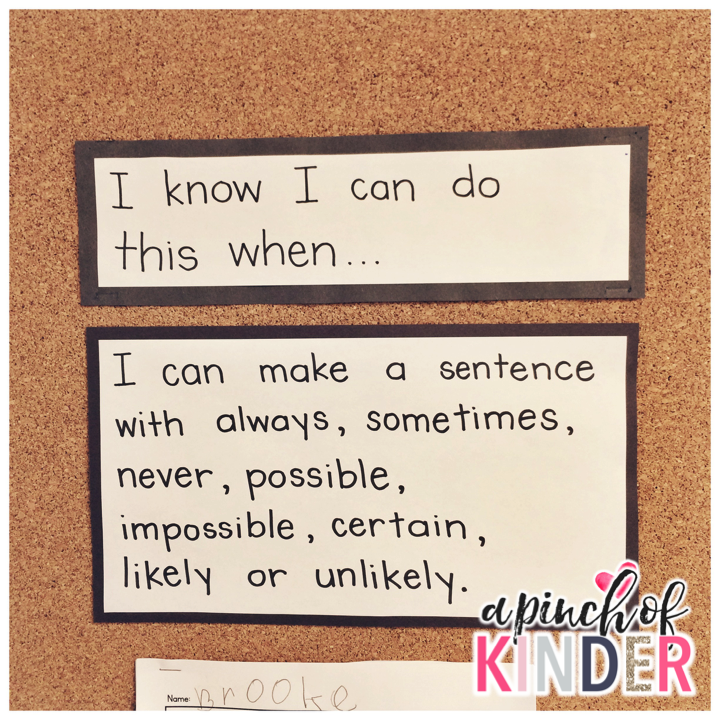 Then I had a student give me a sentence and we wrote the sentence together on the chart paper. We underlined the who ("I") in red and the what ("like to read books") in orange. Then I asked them which other question we could answer to make the sentence longer. One of my students came up with "because reading books makes you a better reader" so we added that and underlined it in pink to show that that was the "why". I also added these "Adding Details To Your Writing" checklist to our writing wall so that the kids could use them for their independent writing. If you follow me on my personal Facebook or on Instagram you may have seen this already but I got engaged 2 Sundays ago! Context: The kids were asking about why different teachers had different "spelling" at the beginning of their names. 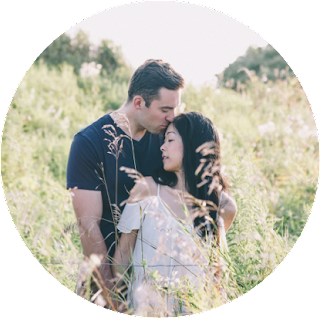 I told them that "Mrs." means that they are married, "Miss" means you are not and "Ms." means you can't tell. We talked about how my teaching partner was a Mrs. and I was a Miss. Student: So you're not married. 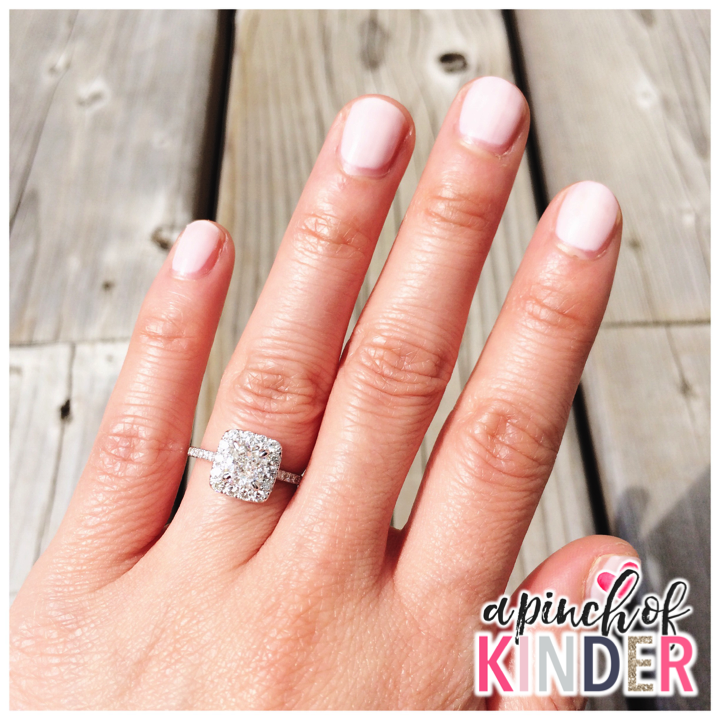 Student: Are you planning to get married? Me: Well I actually got engaged last weekend. Do you know what that means? Me: It means my boyfriend asked me to marry him. 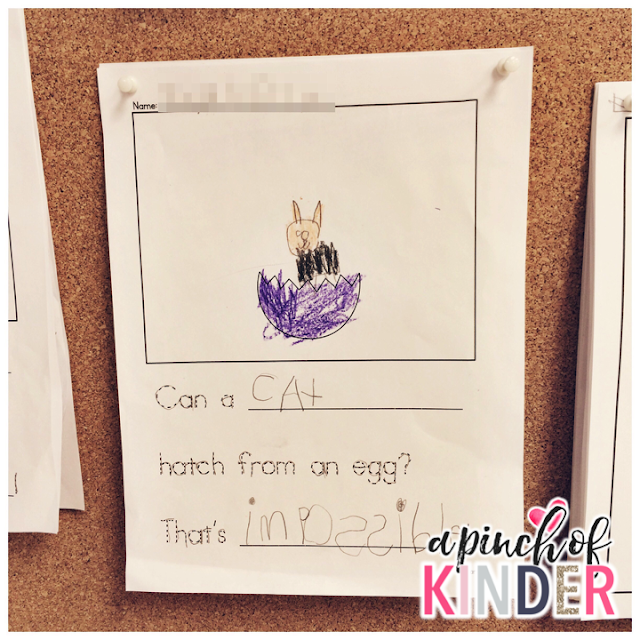 Student: ...so are you still thinking about it? I found this rock stacking challenge/provocation while scrolling through my Pinterest feed. 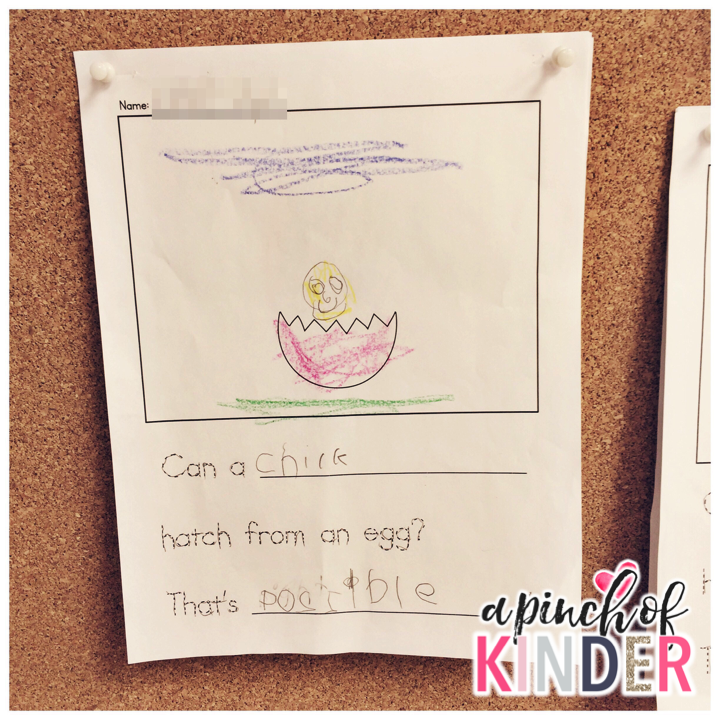 The original idea is from Anamaria of Wonders in Kindergarten. She has an amazing blog and Instagram account! Although it only held their interest for a couple of days, they really loved the challenged for those two days. 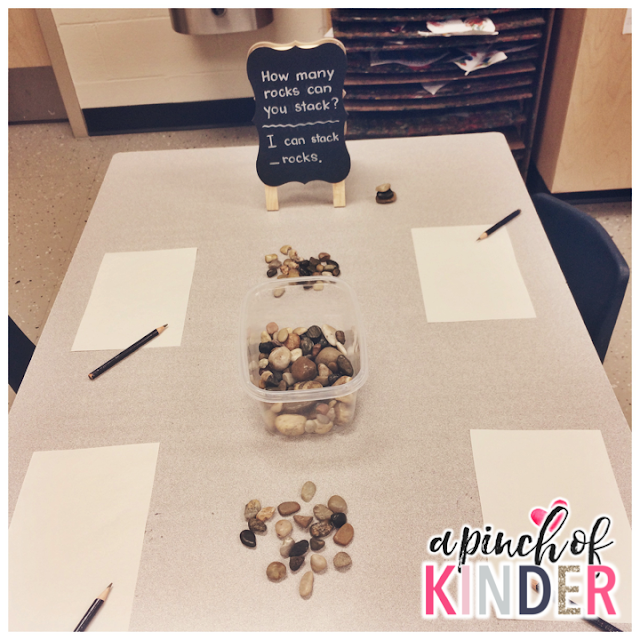 It is great for fine motor and it is actually very tricky to get the rocks to stack! One of my boys really impressed me. First he asked me if he could "make a plan". Well if that isn't music to my ears I don't know what is! I asked him about his plan and he told me that he thinks it will easier to stack the rocks if he can find the flattest ones. Then he proceeded to find all the flattest rocks and started to stack them. He drew a picture as he went of what was working. I was so impressed by his thinking! I got these "I Can Draw" books from the June Scholastic Book Order (SeeSaw) and they have been such a huge hit! 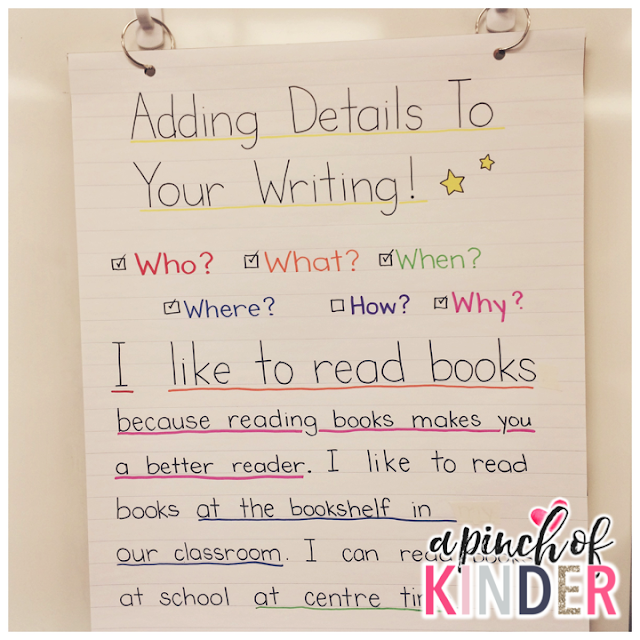 Of course they are great to put out with paper or whiteboards but how they have been a real life saver is for guided reading. 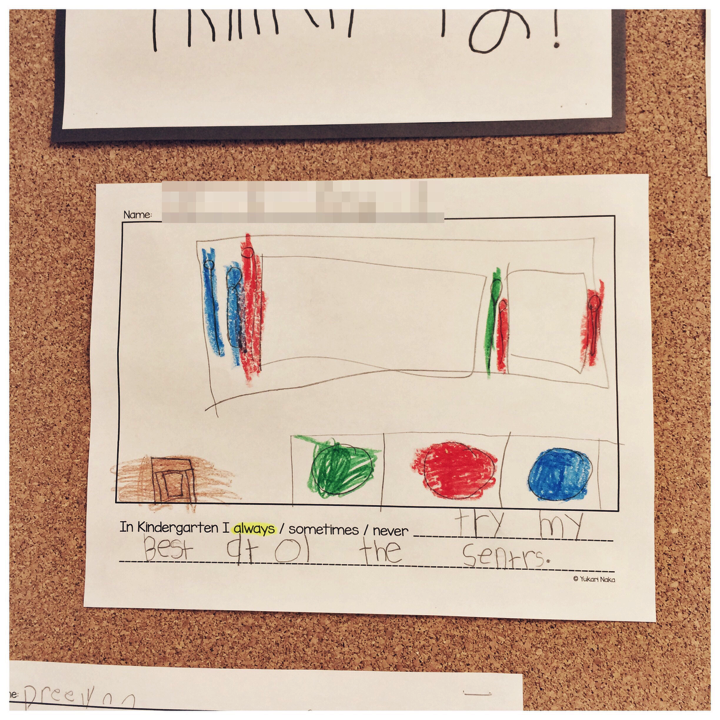 One of my little kiddos in my class has difficulty with drawing a picture to match at the end of guided reading when we do our writing portion. It doesn't help that he thinks it needs to be just right for it to be good. Usually I draw dots for him to trace or draw a step by step model for him to follow. Now I can (sometimes) flip to one of the pages and keep it open for him to follow! 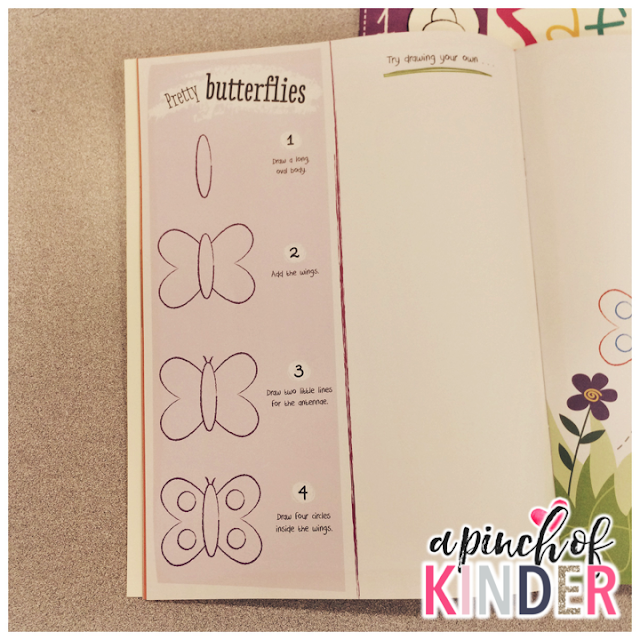 I am planning to photocopy and put this page out at the water colour painting centre to support kids with a butterfly painting provocation I plan to put out next week! 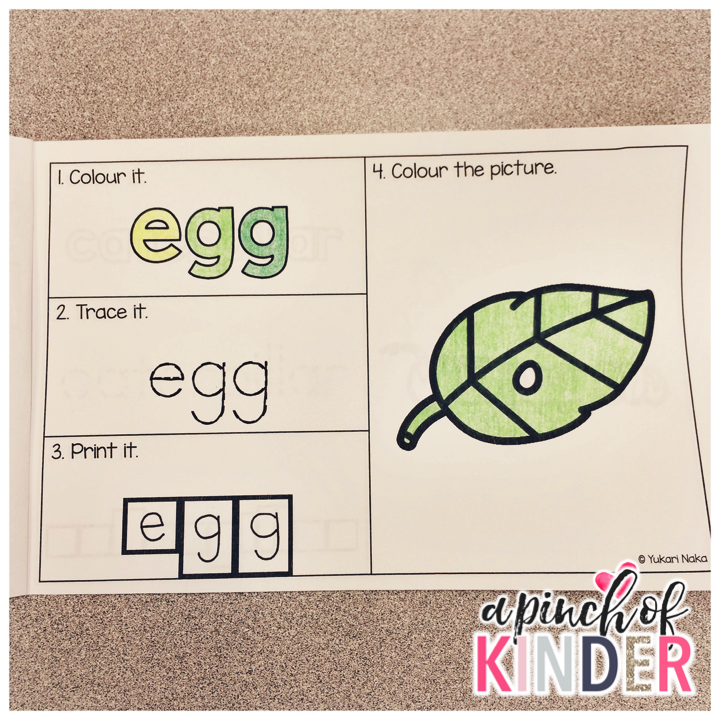 There are so many cute animals for the kids to draw with clear, easy steps! 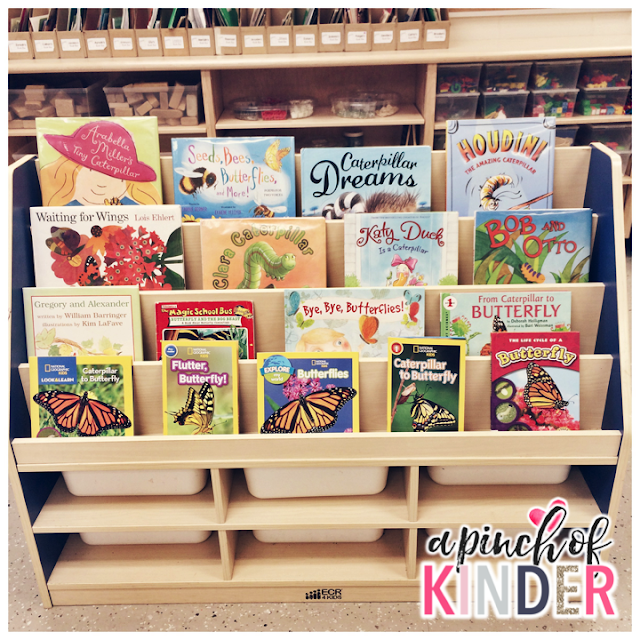 I highly recommend them if you are looking for one more thing to order from Scholastic! 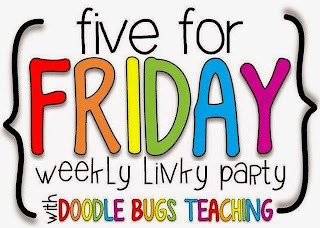 Click on the image below to check out Kacey's Five for Friday, read more Five for Friday posts or to link up your own! 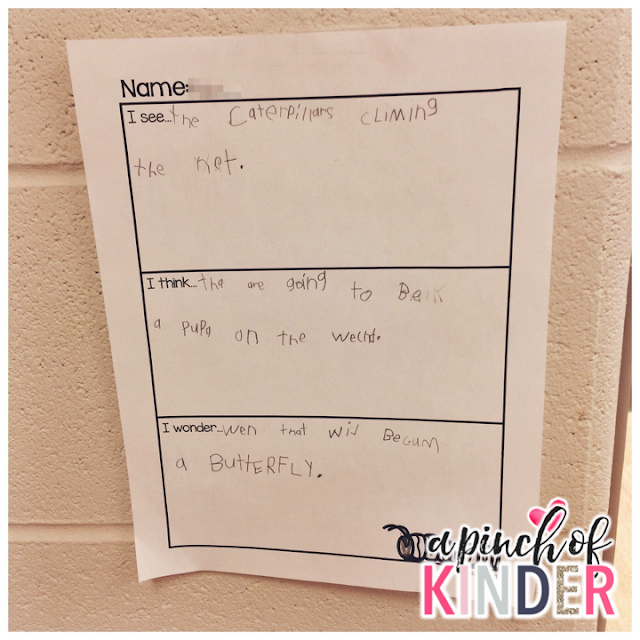 This is my third year raising caterpillars in the classroom! It is always such a neat experience for the kids. 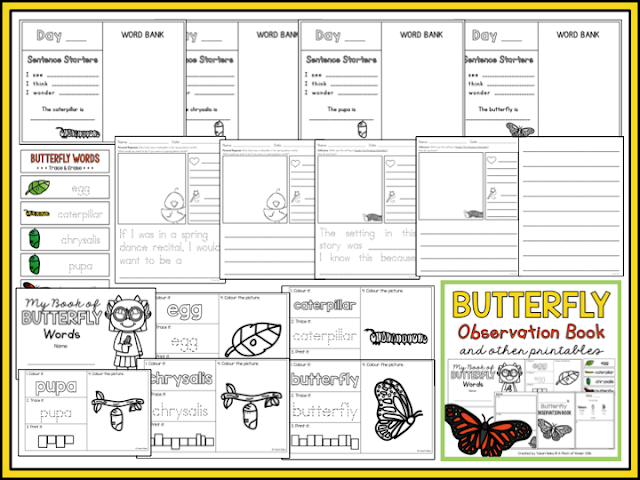 Here are some of my favourite activities/ways I encourage observation and wonderings. 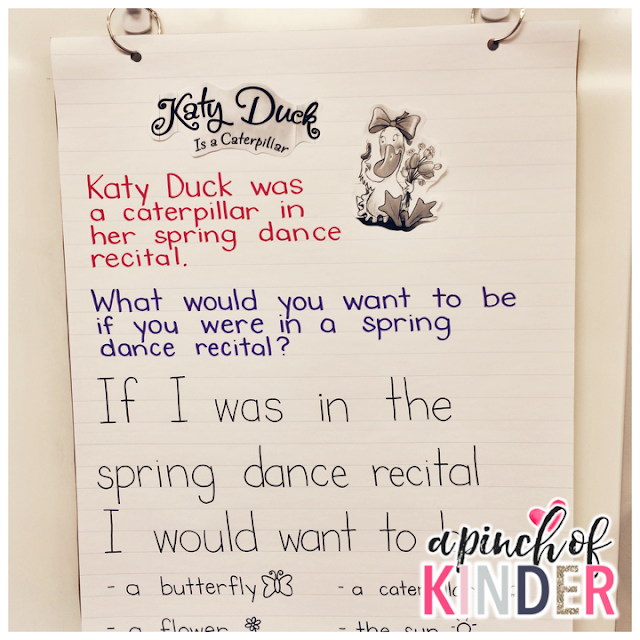 "If I was in the spring dance recital I would want to be a turtle. I would want to be a turtle because they are cute." This year we were lucky to have the box delivered during the day! We put our regular activities on hold and gathered at the carpet. We told the kids there is a surprise inside the box and we gave them three clues about it. Then the kids took turns making a prediction about what they thought was inside the box. We opened the box and I walked around so that the kids could take a peek inside the container. So many of them thought they were ants! 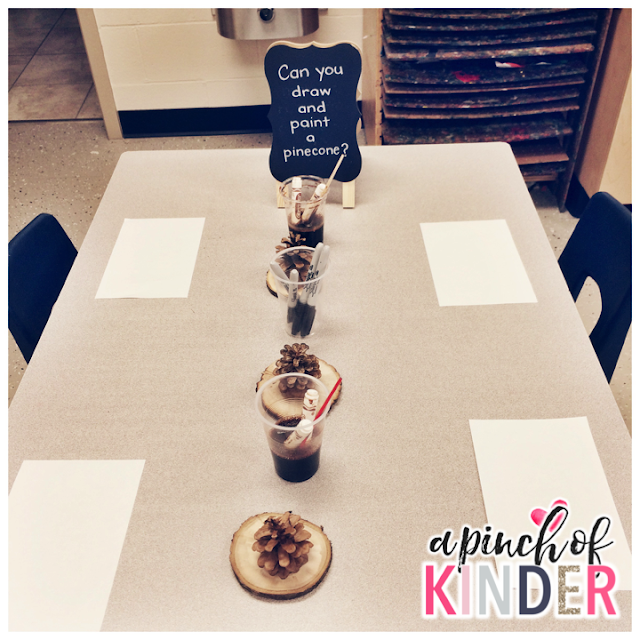 One of our SK's remembered doing this last year and correctly guessed that they were caterpillars. After school we mixed the food and transferred 2-3 caterpillars into each container. Now they were ready for the kids to observe! The next day we started observing our caterpillars! 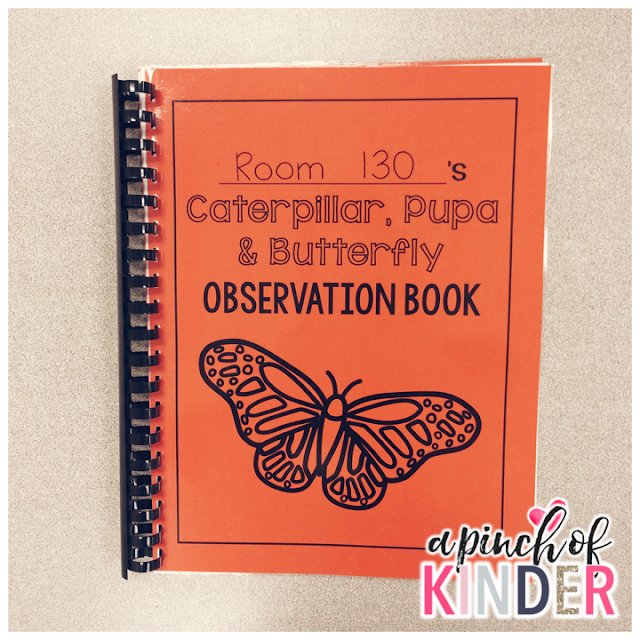 The special helper completed a page in our "Room 130's Caterpillar, Pupa & Butterfly Observation Book". 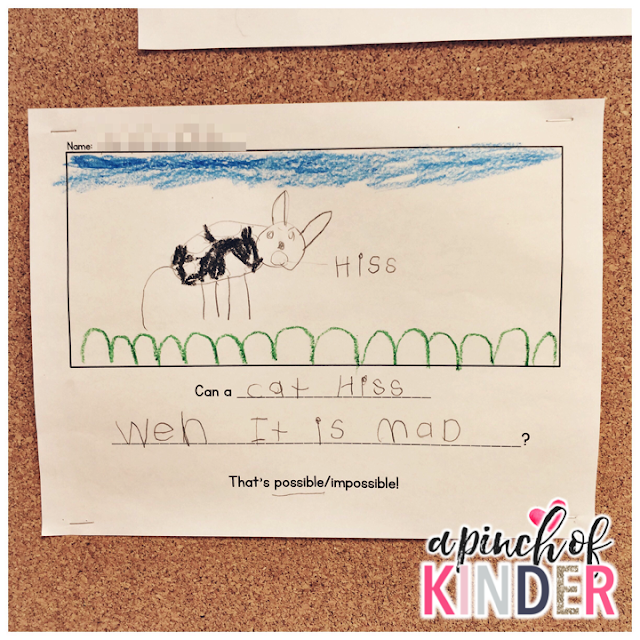 Some students recorded observations on the I see/I think/I wonder sheet you see below. Each day the special helper writes the new day, check off which stage the butterfly is in and write an observation sentence by finishing the stem "I see..." We also encourage them to look closely and draw a picture as well. 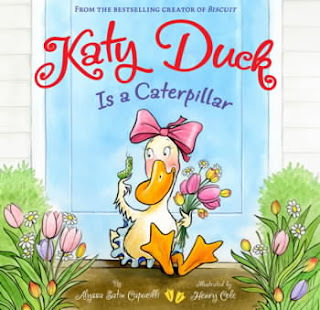 "I see a caterpillar growing. It is getting longer." I see the caterpillars climbing the net. I think they are going to be a pupa on the weekend. I wonder when they will become a butterfly. Around Day 6 we set out this invitation for the kids to count the caterpillars. There were 18 caterpillars. 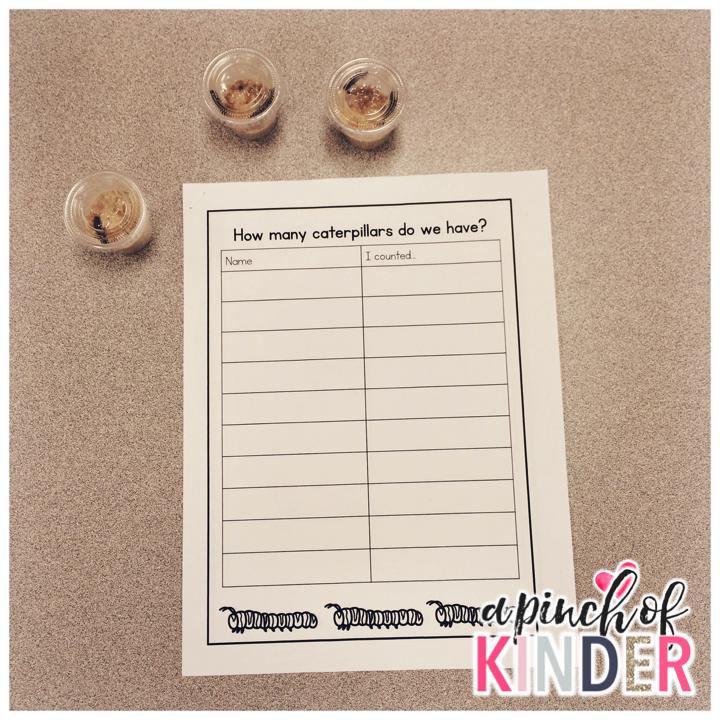 We will use this number when they start to become pupas and keep track of how many pupas and caterpillars there are each day (decomposing numbers). You can grab the recording sheets by clicking on the image below. 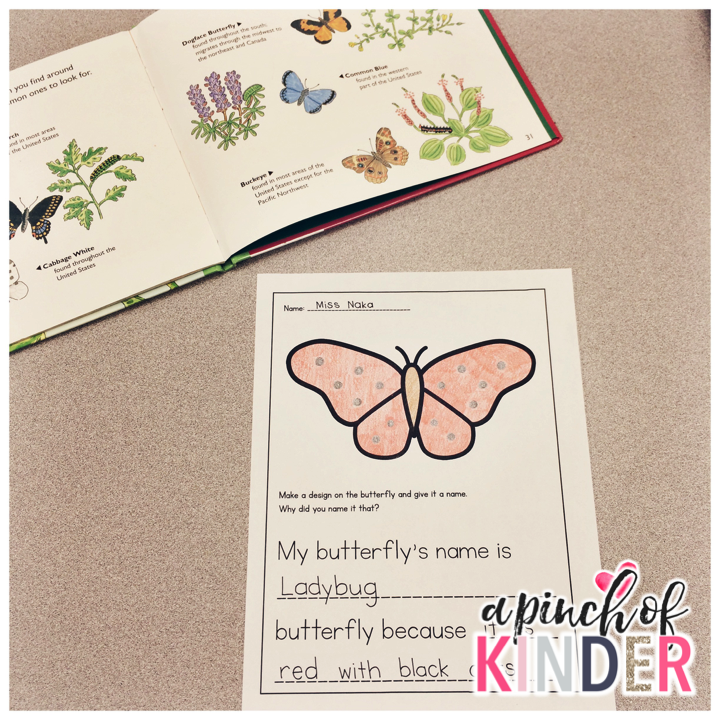 my ECE and I found this awesome page where it shows us different butterfly species and their names. We thought that this would lend to a great discussion on making inferences on why each butterfly is named that. 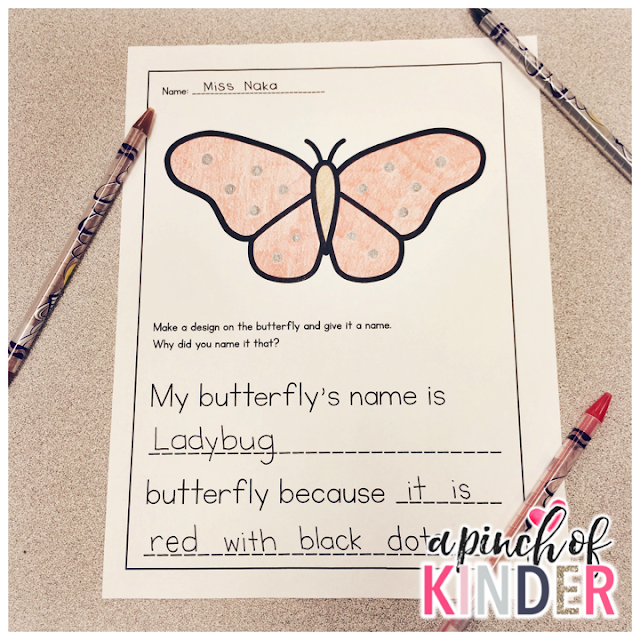 After the lesson we introduced this printable and asked the students to make their own butterfly, give it a name and write why they named it that. 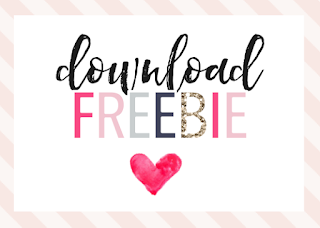 You can grab this printable for free by clicking on the image below! 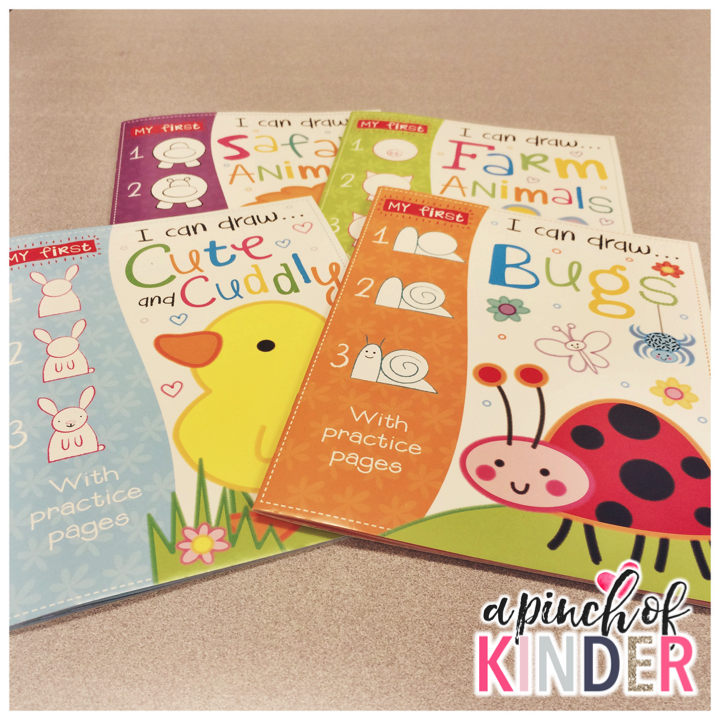 My kids love these thematic word booklets! 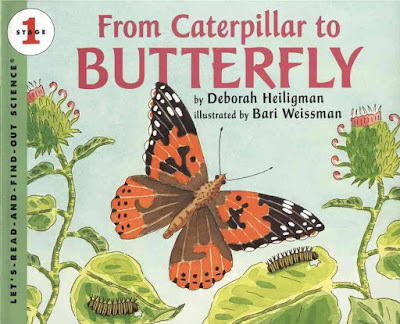 The booklet includes egg, caterpillar, pupa, chrysalis and butterfly. The kids colour the word, trace the word, print the word and colour a matching picture. I shared this with my teammates as well and they said that their kids loved the booklet too! Here are some of our favourite caterpillar/butterfly books that we had on our bookshelf while the caterpillars/butterflies were in our classroom. Here is another independent centre idea! 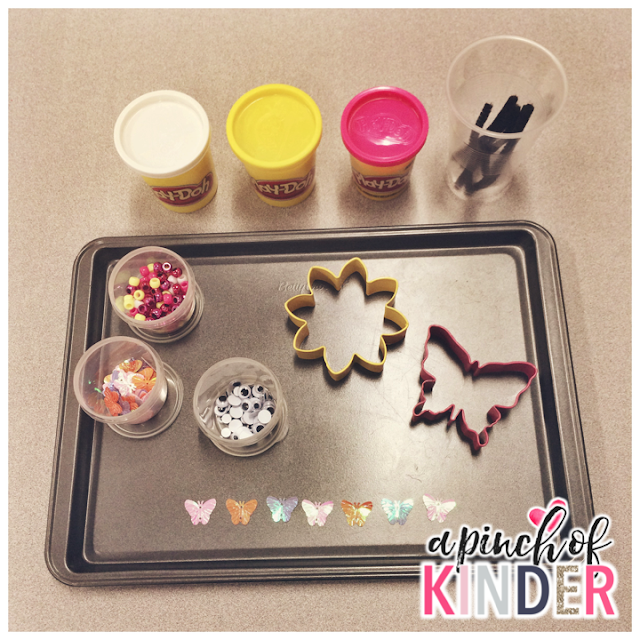 I set out some play dough with black pipe cleaners, beads, butterfly sequin, googly eyes and flower and butterfly cookie cutters. They were encouraged to create a butterfly, flower, a pattern or anything else they wanted! I got the cookie cutters at Michaels. 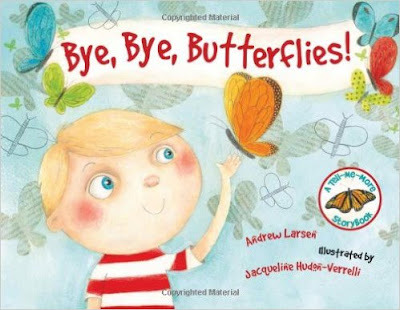 We haven't released our butterflies yet (they are still just starting to create chrysalides) but this is my favourite read aloud for when we do release them. A few days after all of the butterflies have emerged out of their chrysalides we take our butterfly net outside. We sit in a circle and read this book. 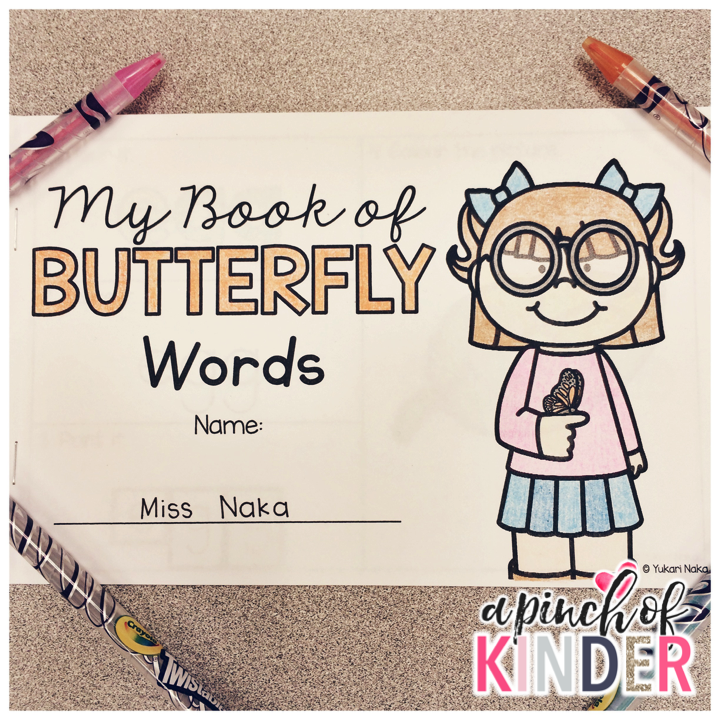 It is the perfect book to read before releasing the butterflies! Then we open the net and gently help the butterflies out of the net. If they cooperate, we put the butterflies on the kids hands until they fly away. If you rub a piece of orange on the kids hands they will stay on the hands a little longer and some butterflies will even drink the orange juice off their kids hands! 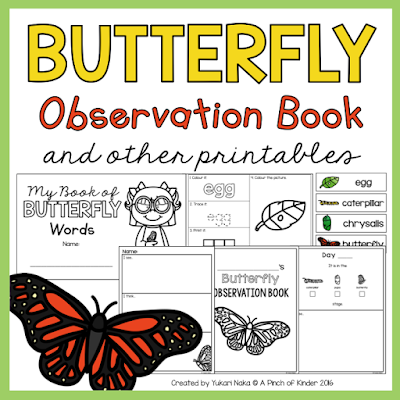 If you are interested in checking out any of the resources you see in this blog post you can find them in my Butterfly Observation Book and Other Printables unit on TPT. 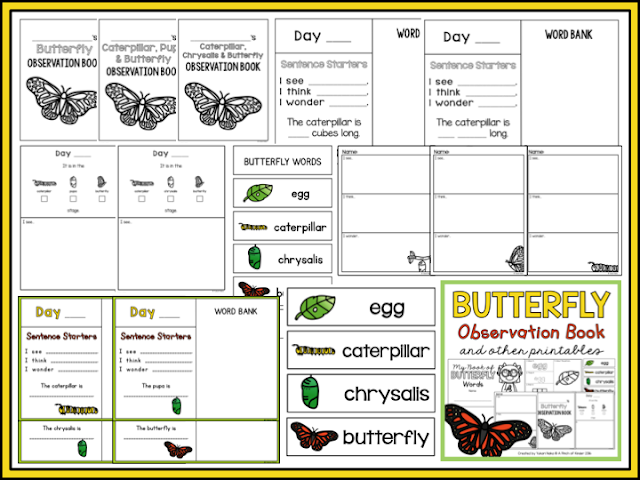 I hope you were able to get some new ideas for your butterfly observations! 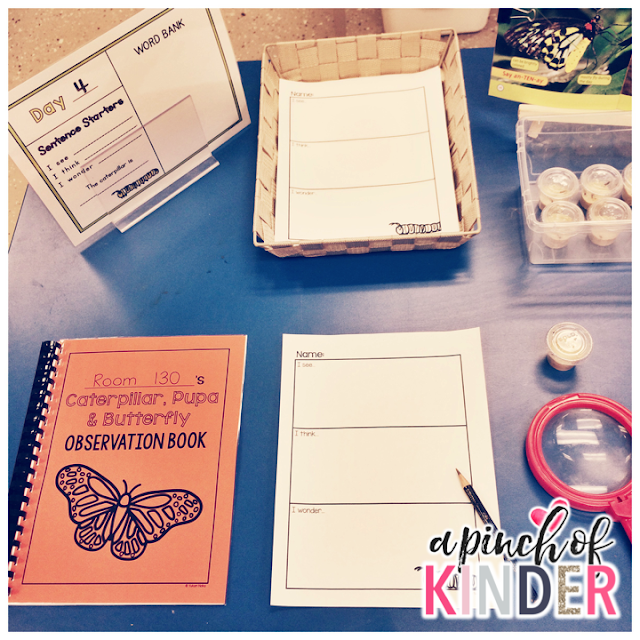 What are your favourite activities for observing caterpillars grow? 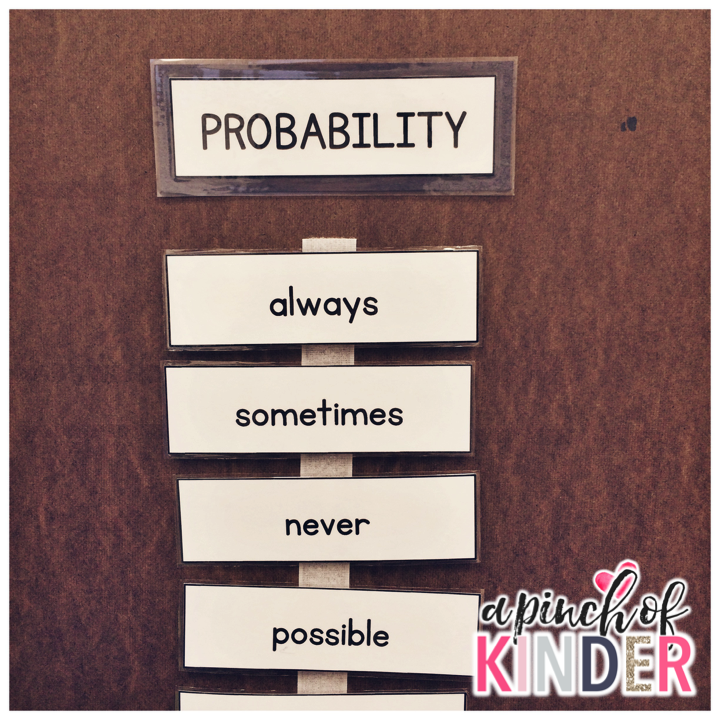 I'm super excited to share how I taught probability to my class this year! In the past I was always scrambling around or teaching probability here and there. 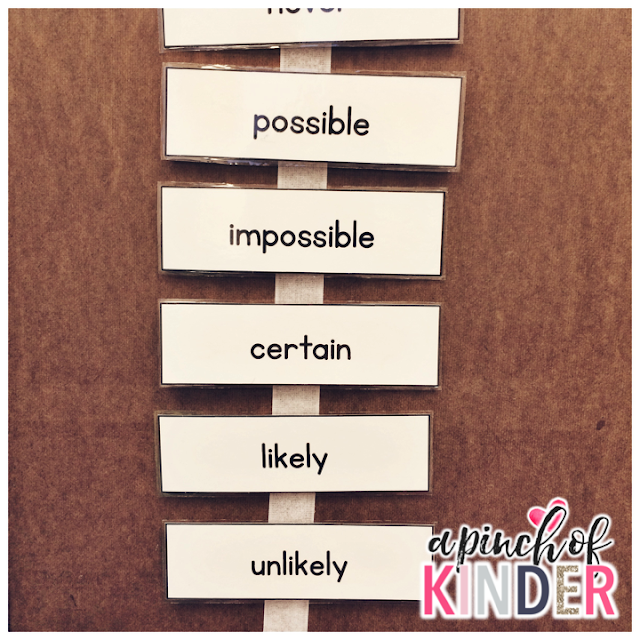 I finally put together a mini unit and it has helped me be much more intentional about how I teach the probability words this year! 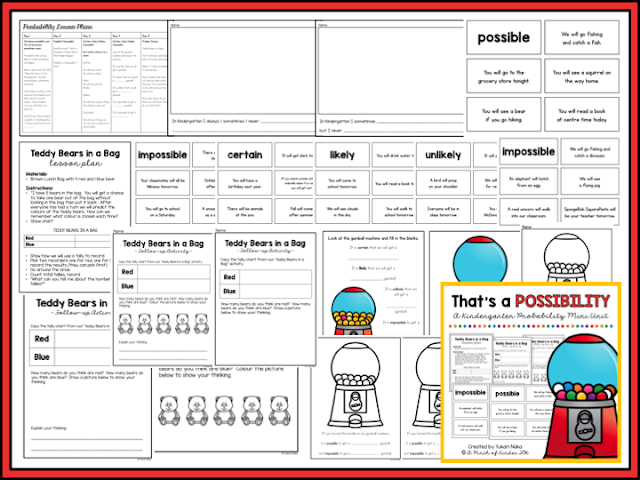 DM5.4 use mathematical language in informal discussions to describe probability. Here is an overview of my 6 day unit plan. 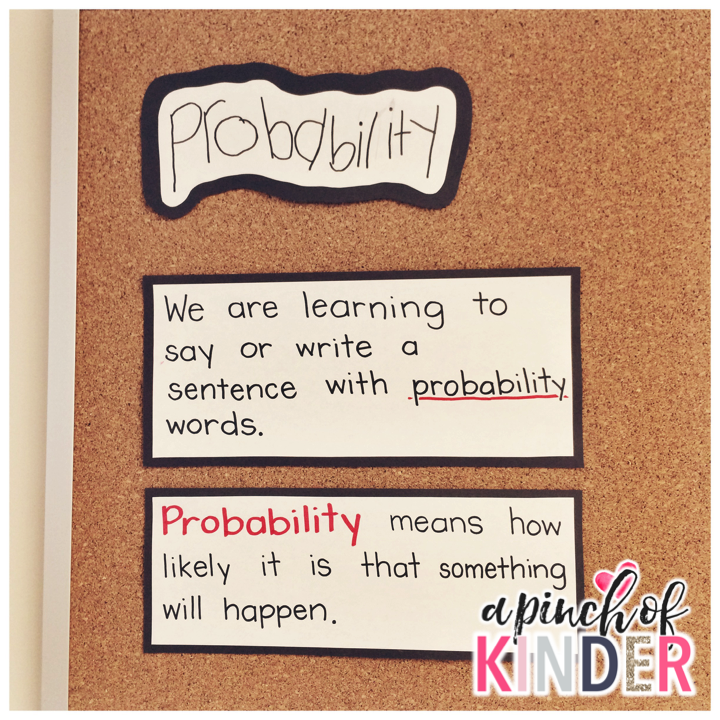 On the first day I introduce the word probability and teach the students that probability means how likely it is that something will happen. I also introduce the learning goal and success criteria for the unit. Then I introduce the first 3 probability words always, sometimes and never. Next I introduce the anchor chart "Things We See Or Do In Kindergarten". 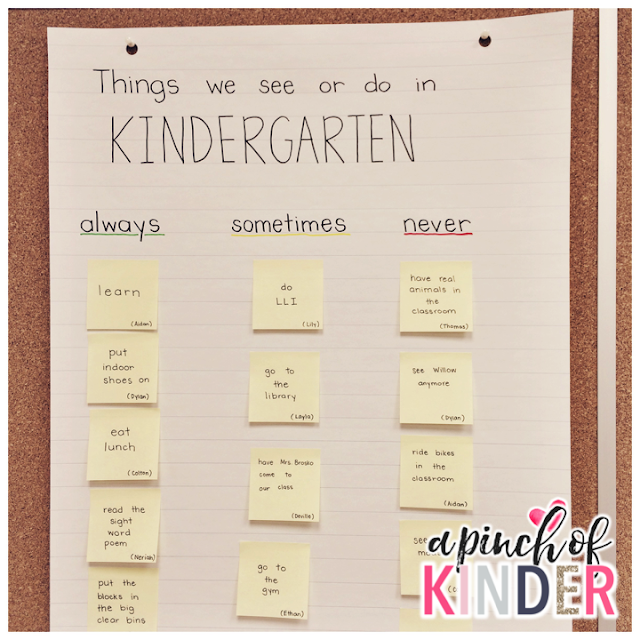 We brainstorm ideas for things we always do or see, things we sometimes do or see and things we never do or see. 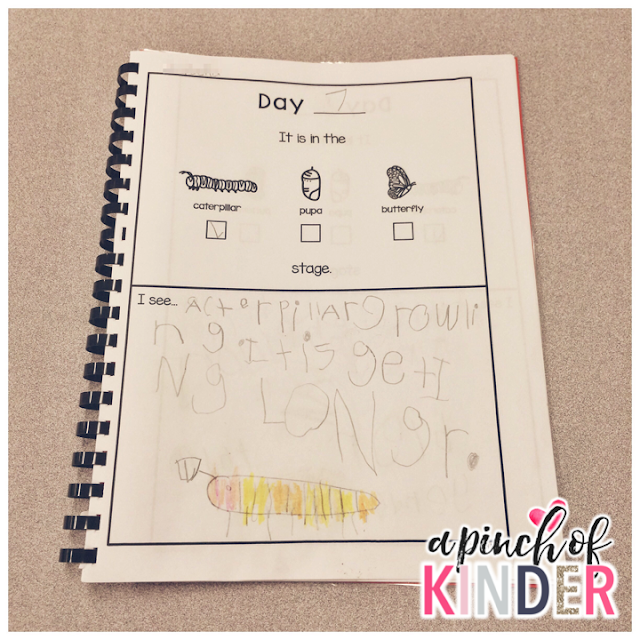 At centre time students complete their own "In Kindergarten I always/sometimes/never _____________" or "In Kindergarten I sometimes __________ but I never _________" sentences on these writing pages. "In Kindergarten I always try my best at all the centres." 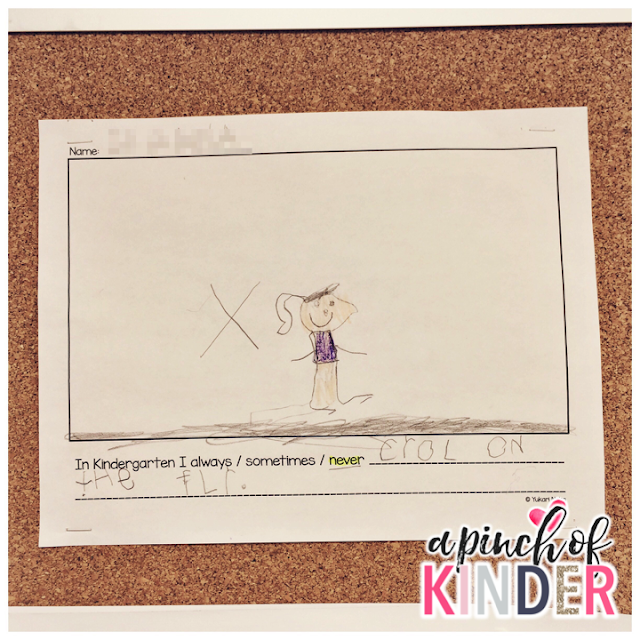 "In Kindergarten I never crawl on the floor." On the second day I introduce the words "possible" and "impossible". 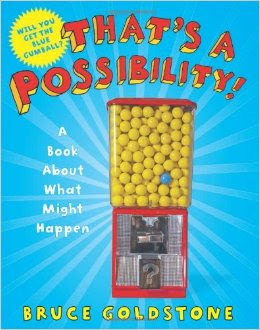 I read them the first few pages of the book "That's a Possibility: A Book About What Might Happen" by Bruce Goldstone. 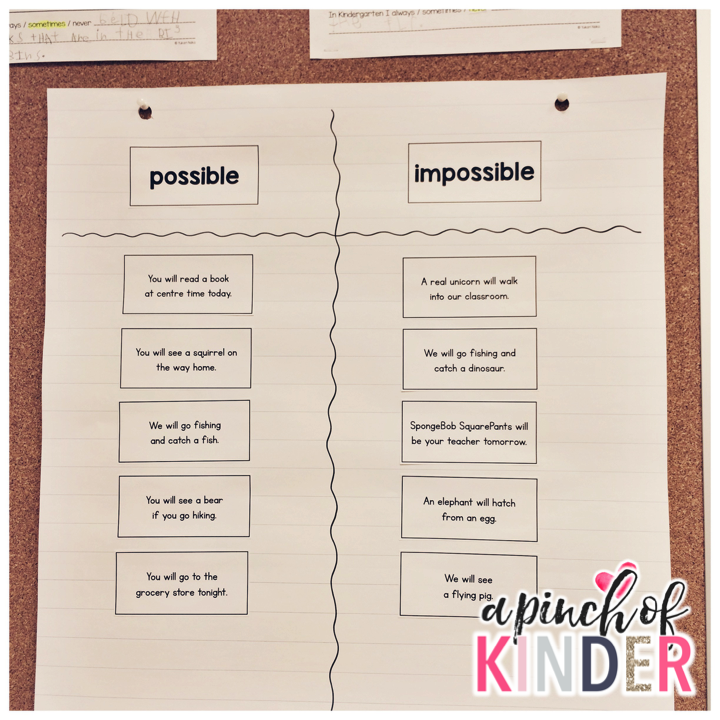 I stop at the pages with the eggs and we move to sorting possible and impossible sentences on a t-chart. I read the sentences and have the students tell me if it's possible or impossible. At centre time they have the option to write their own possible/impossible sentence. 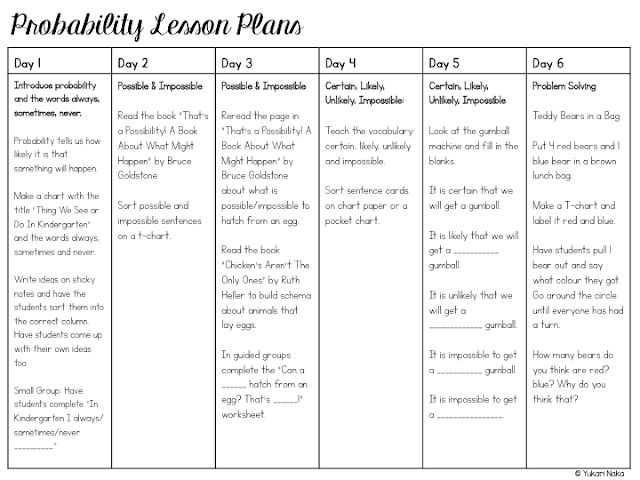 On the third day I start by reviewing the page with the eggs in the book "That's a Possibility!" and I tell the kids that we will be writing our own possible/impossible sentences of things that can and cannot hatch from eggs. 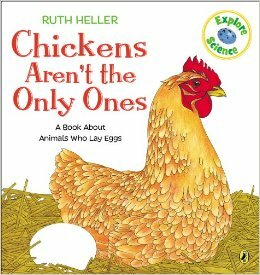 to increase their knowledge of what lays/hatches from eggs. 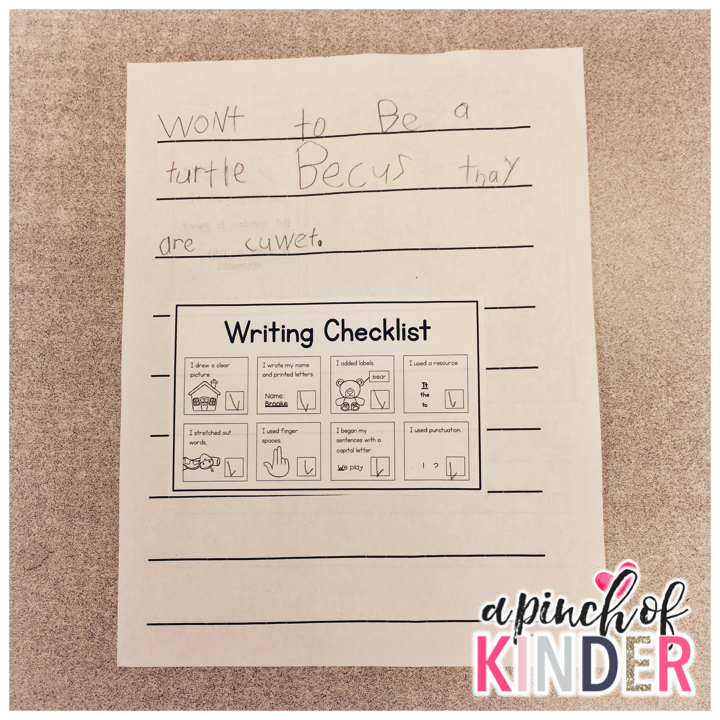 They absolutely loved this writing activity! They continued to do this writing activity for several days after I introduced it. 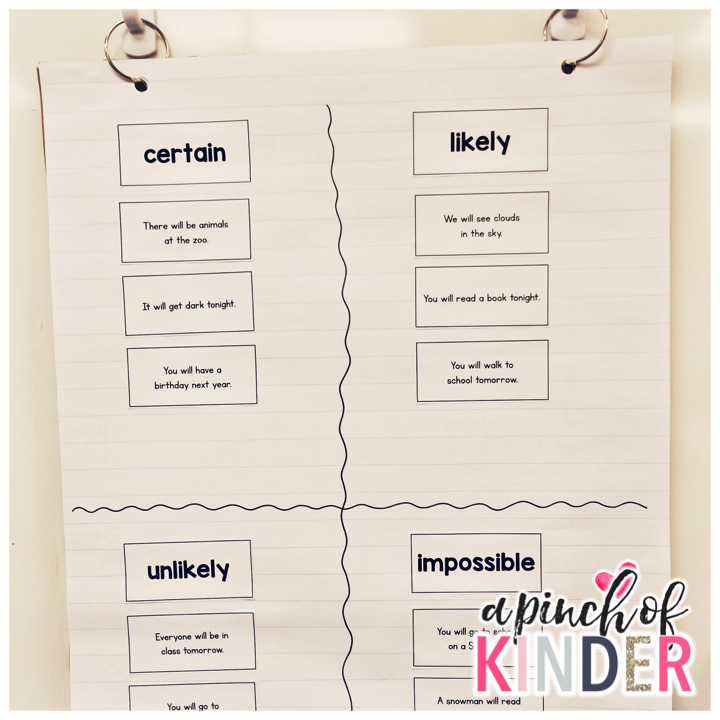 On the fourth day I introduce the new vocabulary (certain, likely and unlikely) and we sorted the sentences on chart paper. This was a little tricky! 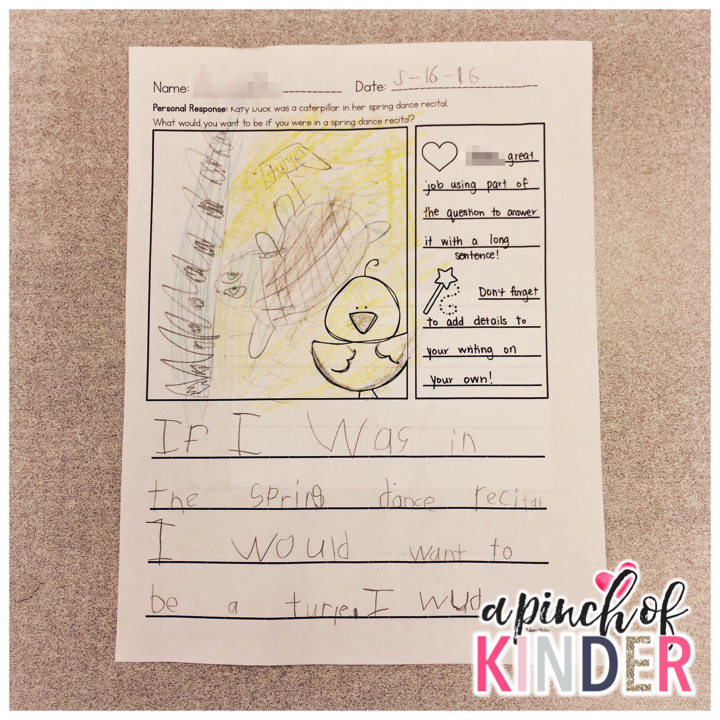 We talked about how some things might be likely for some people but unlikely for others. For example we talked about how most kids in our class walk to school so it is likely that "you will walk to school tomorrow." However, one of our kids doesn't come to school on Fridays so for him it would be impossible and a couple of our kids get driven to school so for them it would be unlikely. Next year I think I will split this up into 2 days and do certain and impossible on one day and likely and unlikely on another. 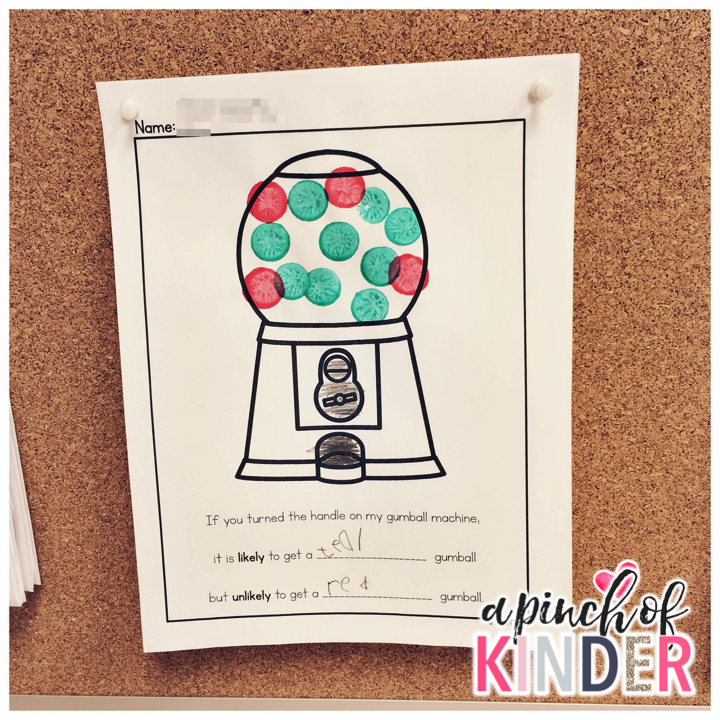 It is certain that we will get a gumball because that is the only thing that is in the machine. It is likely that we will get a yellow gumball because there is a lot more yellow gumballs than pink gumballs. 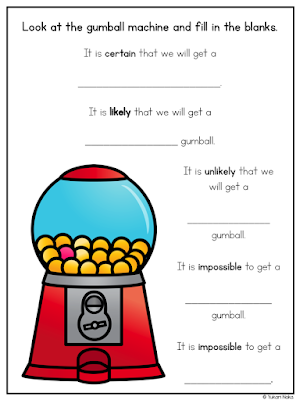 It is unlikely that we will get a pink gumball because there is only 1 gumball. It is impossible to get a green gumball because there are no green gumballs in the machine. 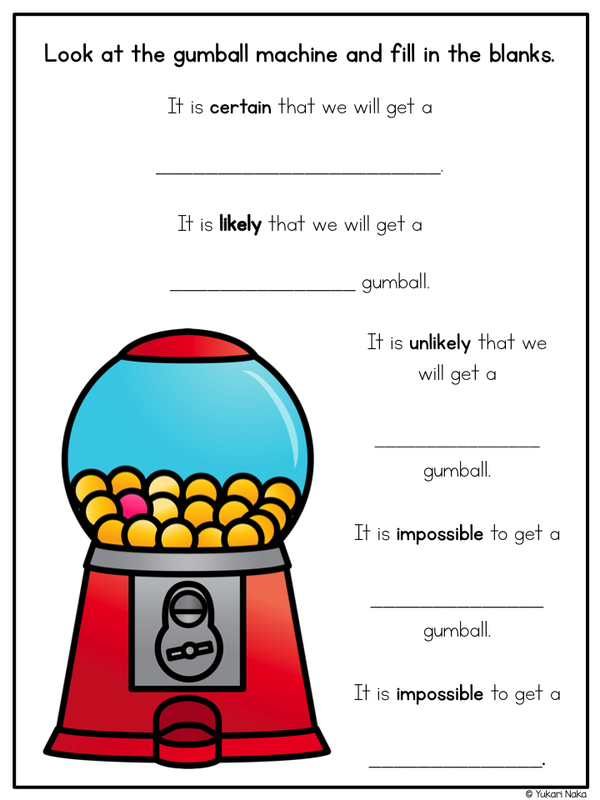 It is also impossible to get a dinosaur because there are no dinosaurs in the gumball machine. Then the next day at centre time we did certain and impossible. 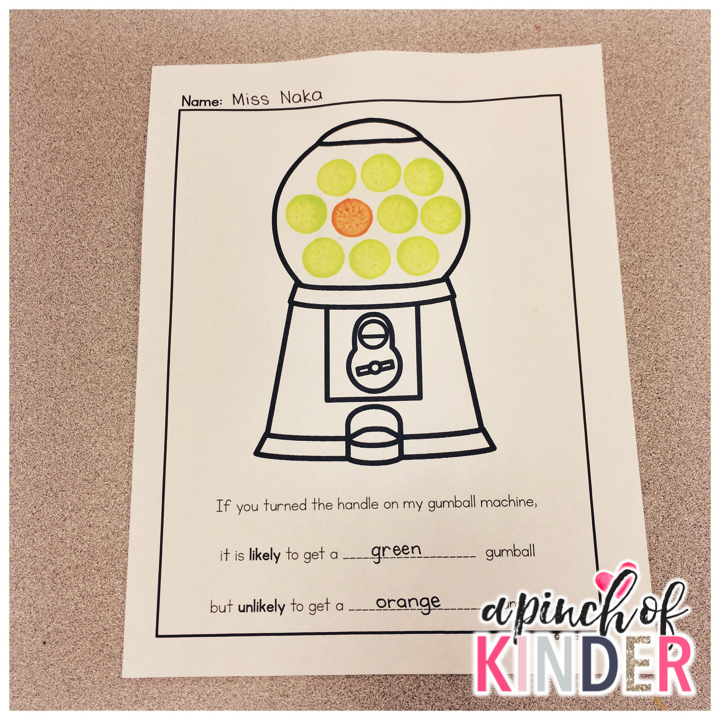 For this one I told them that they can only pick one colour since if there was more than one colour it won't be certain that that colour would come out of the gum ball machine. The day after that we did the likely/unlikely sheet. For this one I told them to do one gum ball in one colour and the rest of the gum balls in another colour. 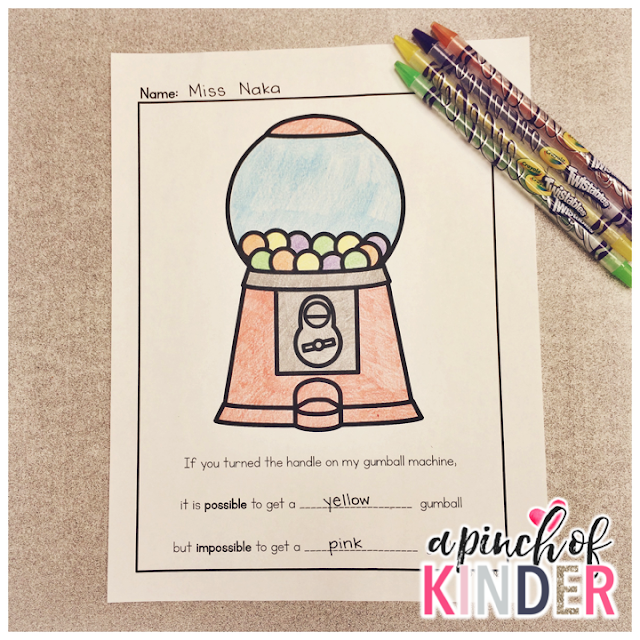 We talked about how it is not impossible to get the colour of the one gum ball but it is unlikely. He asked me if he could do more than 1 red gumball since teal will still be more likely as long as there was more teal than red. I love that this student really got the concept! These gumball sheets were a HUGE hit! 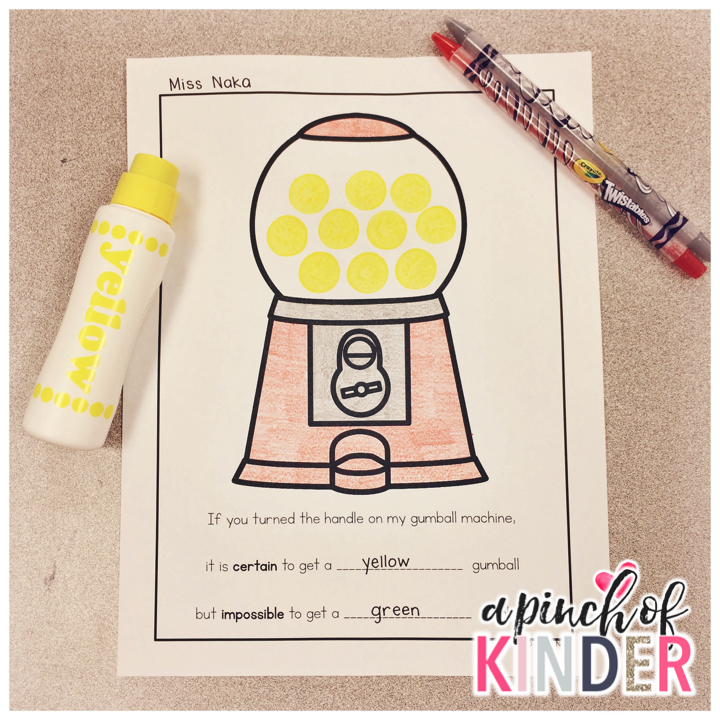 The kids loved making them and I was constantly running out of copies! On the sixth day we did some problem solving! I showed them the chart above (not filled in) and a brown paper bag. I told them that there are 5 bears in the bag and that we were going to put our hand in the bag and pull out 1 bear without looking inside the bag. We will record what colour it is. Each student will have a turn to pull out a bear and say what colour they got. Then we did the activity as I recorded what colour each person got with tallies. Then I asked them "There are 5 bears in the bag. How many red bears and how many blue bears do you think are in the bag?" It was a good chance to review decomposing numbers as some students gave me combinations that did not equal 5. We also talked about how the number of red and the number of blue bears can't be the same since you can't put 5 things into 2 equal groups. 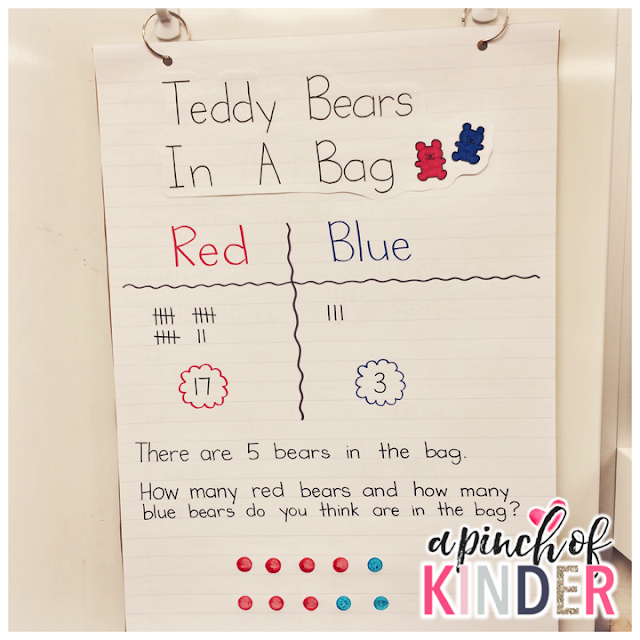 We also talked about how it would be impossible to have 0 red bears and 5 blue bears or 5 blue bears and 0 red bears because we know there is at least 1 red and 1 blue bear in the bag (since we saw it come out of the bag). Some students said that since there were a lot more tallies for red they think there are more red bears than blue bears in the bag. We recorded our two predictions of the colour combinations below the tallies and then I opened up the bag to show them what was inside. (It was 4 red bears and 1 blue bear). We talked about how since there were a lot more red bears than blue bears it is more likely to get a red bear than a blue bear when we were pulling them out of the paper bag. We also added these probability word cards to our math wall as I taught them for the kids to use at centre time. You can grab the word cards for free by clicking on the image below! You can get the printables you see in this post and more in my "That's a Possibility! 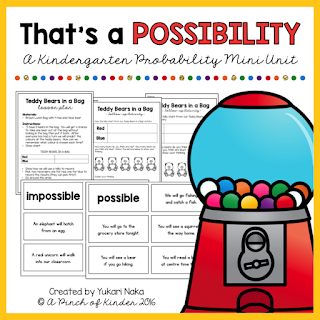 A Kindergarten Probability Mini Unit" on TPT. You can click here or on the images below if you are interested in checking it out! What are some of your favourite probability lessons/activities? Please let me know in the comments!